When The Beatles first celebrated the founding of their fictional Sgt. Pepper’s Lonely Hearts Club band “20 years ago today,” little did they know that the world would still be celebrating that milestone half a century later. It’s little surprise, though. The year of that album’s birth, 1967, still resonates as one of the most significant twelve months in music history. In fact, it’s a renaissance period that resonates even today, for the innovation, invention and exploration that rock music experienced that year has rarely been duplicated, before or since. For many bands, including Cream, The Jimi Hendrix Experience, Pink Floyd, Traffic, Buffalo Springfield and the Jefferson Airplane, it meant the first breakout from the underground to the mainstream, with significant songs that defined them and a new era changed rock from pop to progressive. Psychedelic sounds came to the fore, as new arrangements, instrumentation and attitudes inspired changes in underground radio, popular culture and political opinion. Indeed, 1967 was a year that changed everything and made rock an art form all its own. Here are the 10 best songs turning 50 this year. Part of the opening salvo on Sgt. Pepper, this tuneful number, written by Lennon and McCartney and sung by the ever-affable Ringo Starr, became the glad-handed invitation for a communal embrace. Granted, the question that read “What do I see when I turned out the light?” seemed a somewhat odd inquiry, but then again, best to ask rather than end up with a case of mistaken identity. Inspired by the riots on L.A.’s Sunset Strip, when young people took to the street in response to the authority’s crack down on their late night haunts, “For What It’s Worth” Springfield, became not only one of rock’s first anthems, but also a call to arms that heralded both a “field day for the heat,” and “a thousand people in the street.” Stephen Stills’ coarse vocals gave an absolute air of urgency that made the question in the chorus, “Hey, what’s that sound?” all too obvious and relevant, even today. Given its gothic tones and seemingly incongruous lyrics, “Whiter Shade of Pale” became the first worldwide hit for a band capable of blending a seemingly disparate mix of Bach, a concerted croon, religious imagery and perfect poetry that had listeners scratching their heads in wonder. Despite a series of exceptional albums, the band’s fame was relatively short-lived as far as singles success goes, but regardless, this song created a template that ensured their lasting immortality (especially getting another boost with Annie Lennox’s cover on 1995’s soundtrack to The Net). An often shunned singer from South Texas, Janis Joplin became one of the most explosive voices of her generation. Although she was a troubled and tattered individual, her voice became symbolic of the assertive stance that emerged defiantly from San Francisco and then spread its way worldwide. Joplin stunned the crowd at Monterrey and became a global superstar, but her utter loneliness and lingering substance abuse contributed to her early demise. Nevertheless, this song established her as a singer who epitomized the needs and desires of those looking for love in a new freewheeling frontier. Rarely had a stylistic transformation seemed so complete. The Moody Blues began life as a semi successful blues band, but with a shift in membership they became the new sound of psychedelia, a dreamy blend of surrealism and fantasy that seemed to speak with the authority of the gods themselves. This song, from their first landmark album, Days of Future Passed, established a high standard early on, a melding of inventive rock and orchestration that resulted in a sound that was heady and heavenly all at the same time. The Grateful Dead were the harbingers of hippiedom whose blend of tradition and trippiness was manifest in extended jams with acidic accoutrements. In many ways, the band’s eponymous debut, from which this song was taken, provided the template for the remaining albums that would follow, helping to mould a combination of gratuitous noodling, psychedelic sojourns and whatever other flights of fancy they imbued whilst performing live before their enthusiastic audiences. “We’re not a band that makes great albums, Jerry Garcia once told an interviewer. “That’s just a guise we adopt to get by in the studio… Our dynamic range goes far beyond what can be accurately be got [sic] down on vinyl.” Nevertheless, “Golden Road” served as the starting point for the a path they paved towards the future. With crazed musical mastermind Syd Barrett at the helm, Pink Floyd started the space race with this full tilt cosmic cacophony, and from there established an acid-soaked sound that would inspire generations of surreal psychedelic ensembles to come. Culled from their groundbreaking debut album The Piper at the Gates of Dawn, it created a wash of distortion, improvisation and sonics that set heads spinning and audiences spiralling skyward. The drug references couldn’t have been more implicit. “One pill makes you larger, and one pill makes you small,” sang Grace Slick. Taking her cue from Lewis Carroll’s tale of a girl who chases a mysterious rabbit and then finds herself in a strange new world, it became the theme song for those seeking otherworldly exploration all on their own. “Go ask Alice,” the band implored, although they were the tour guides, not only for San Francisco’s so-called Summer of Love, but for a path to new awareness and insight overall. The year before the release of his landmark album, Are You Experienced, Jimi Hendrix was simply an expat musician looking for his big break. Discovered by Animals bassist Chas Chandler, he relocated to the U.K., assembled a sympathetic trio, and then turned the world upside down with his initial performances in London’s swinging, star-frequented clubs. His explosive performance at the landmark Monterey Pop Festival attracted notice worldwide, but a subsequent U.S. tour as opening act for The Monkees did nothing to advance his efforts. However this song, brimming with psychedelic suggestion, announced the arrival of a groundbreaking artist whose influence resonates even today. Written by bassist/vocalist Jack Bruce and lyricist Pete Brown, and performed by what is arguably rock’s first supergroup—Bruce, guitarist Eric Clapton and drummer Ginger Baker—“Sunshine of Your Love” kicked off with the immortal riff that still lives on its own. 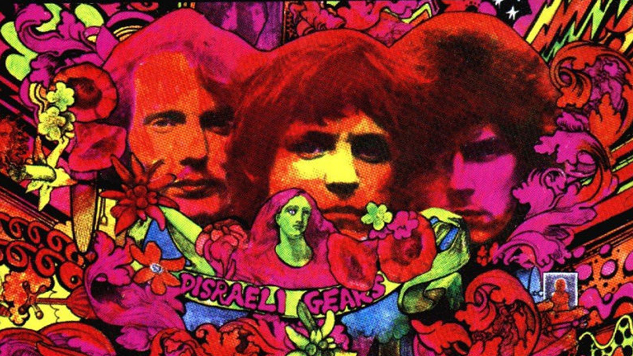 A staple of their set, as well as Bruce and Clapton’s individual repertoires for years to come, its vivid imagery and surreal set-up underscored the imagination, ability and authority that was beckoned forth on the trio’s brilliant sophomore set Disraeli Gears. Rarely has a song or a band assumed such importance.